The Nigeria Police has declared militia leader, Terwase Akwaza, also known as Ghana wanted. 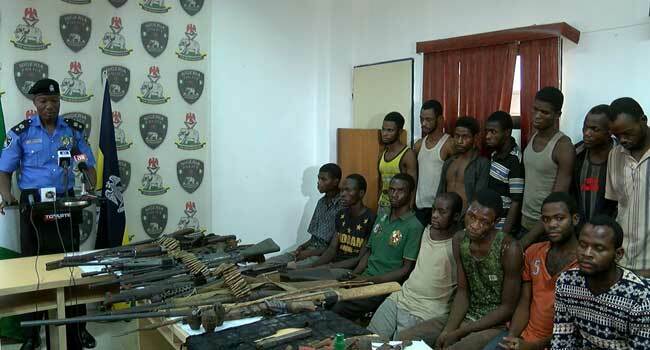 The Force Public Relations Officer, Jimoh Moshood, made the disclosure on Friday while parading 19 members of Akwaza’s gang at the Police Headquarters in Abuja, the Federal Capital Territory. “The said Terwase Akwasa, A.K.A. Ghana, is wanted for merciless killing of several innocent persons, 17 in Zaki Biam and about 50 in other different locations in Benue State; and for wanton destruction of property worth millions of Naira by arson at Zaki Biam in Benue on the 20th of March, 2017; and for other capital offences such as kidnapping, armed robbery, culpable homicide, mischief by fire, criminal conspiracy and others. “Police investigation revealed that he is also responsible for the killing of Mr Denen Igbana (late), the Special Adviser on Security to the Executive Governor of Benue State, Mr Samuel Ortom,” Mr Moshood said. He also announced that the Benue State Government is offering 10 million Naira to anyone who provides information leading to his arrest. “Terwase Akwasa, A.K.A. Ghana, is a dangerous suspect (from) Katsina-Ala Local Government Area of Benue State. He speaks Tiv, Idoma and pidgin English languages fluently. “I want to make it clear that the Benue State Government has placed 10 million Naira reward for anyone with useful information that can lead to his arrest,” the Police spokesman said.